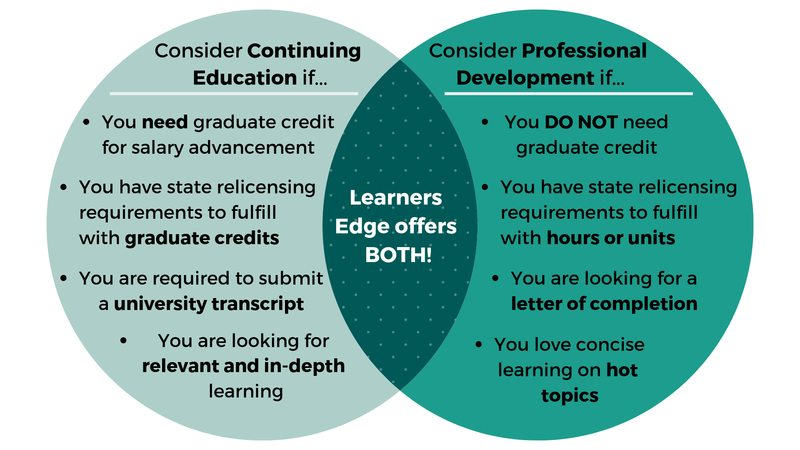 Below is a summary of how Learners Edge may help your continuing education and Virginia teacher relicensing needs. This summary should in no way release individuals from their responsibility of ensuring that the course they take meets their professional needs. We hope it provides assistance in understanding how Learners Edge might help you in the accumulation of clock hours or graduate credit for salary advancement and the Virginia teaching relicensure process. See the Virginia Department of Education Renewal Manual for complete VA teacher relicensure information. Individuals are required to complete the following requirements for license renewal. Acceptable coursework offers content that provides new information and is offered by a regionally accredited two-year or four-year college or university. Courses must be taken for credit, and the license holder must earn a passing grade or a “pass” in courses taken on a “pass” or “fail” basis. 1) Must provide new information and be earned at a regionally accredited two-year or four-year college/university. All coursework for renewal must be completed at a regionally accredited college or university. 2) Must be taken for credit. 3) Must result in a passing grade or “pass” for courses taken on a “pass” or “fail” basis. 4) Must be verified by an official transcript or official student transcript submitted to the chief executive officer or designee of the employing educational agency or to the Department of Education if the license holder is not employed. D. Verification: Official transcripts or official student transcripts are accepted. Grade reports, photocopies, and electronic records are not accepted. A transcript that arrives separately may not provide sufficient identifying information to be accurately matched to an individual’s other credentials. A transcript must be submitted with a cover letter or other document that includes the social security or Virginia license number. Grade reports, photocopies, and electronic records are not accepted.